I have been thinking about walking to Edinburgh from my home in Cheshire for quite some time. Various routes have come to mind, the first being using the Pennine Way. I am about 2 days or so from the southern start in Edale and then would need to find a route from the northern end in Kirk Yetholm to Edinburgh. To cut down the mileage a little I then pondered walking up the Macclesfield Canal which is close to home here to the end in Marple and then making my way to Standedge and the Pennine Way. However, even the canal is not a particularly direct route as it weaves around quite a bit even before it gets to Macclesfield. I then read about a guy who walked from Boston to San Francisco (a really long walk). When he was asked how he navigated, he replied ‘Google Maps’ saying that it kept him off the interstate and took him through places where there were services. So, what did it come up with for me? The most direct route takes me on minor roads from my village to a short stretch of the A50. It then cuts across to pick up the A49 and eventually the A6 all the way to Carlisle. The A7 then goes as far as Langholm before switching to the B-road that climbs over Eskdalemuir to Yarrow and then on to Peebles. The most direct route stays with the A701 into Edinburgh and is 229 miles. I might switch to the A702 at West Linton and come in that way on my last day. 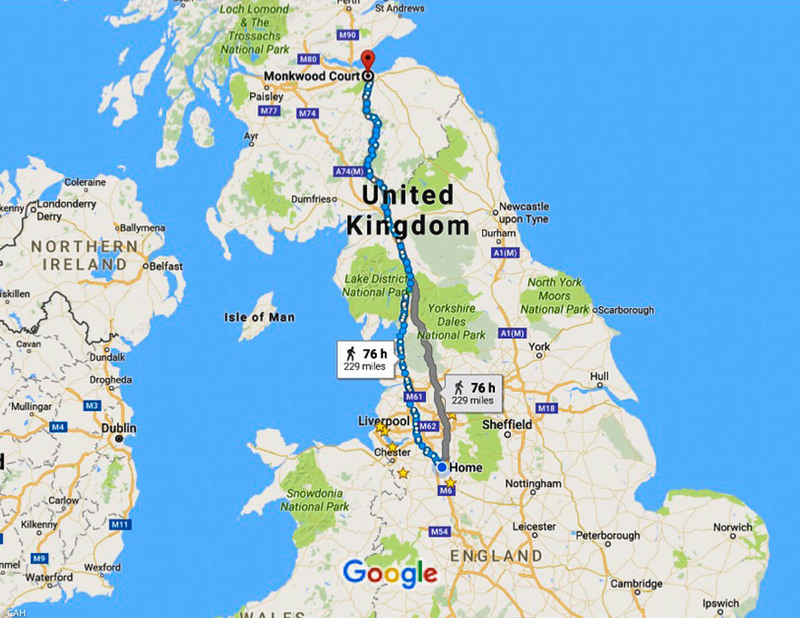 That only adds a few miles and I would take around 15 days with a couple of slow days in the middle around Kendal (despite Google Maps listing 76 hours for the route!). The longest walks I have done so far have taken around 9-10 days in India. We have walked the West Highland Way, the Great Glen Way and the Speyside Way in the last few years but this would be longer. Although it follows main roads for much of the way, there will be footpaths and minor roads to divert along at times. Mostly the towns and hostelries are separated by a day’s walking which is good as I really do not want to have to carry my tent and camping equipment and if there is not a convenient campsite you cannot wild camp in England. This route is of course, the old route to Scotland from my part of the country before the motorways were built. 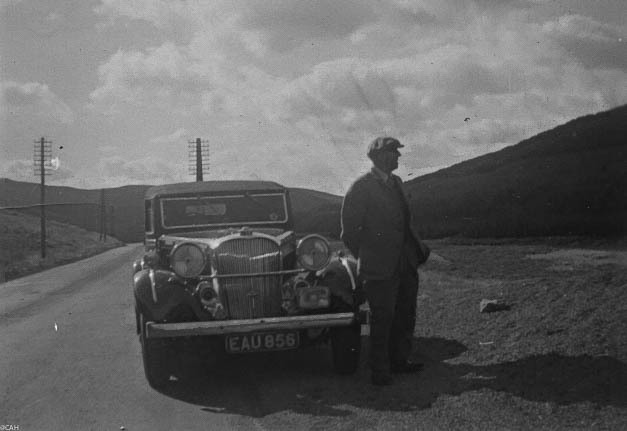 Here is my great grandfather with his car at Shap on the A6 in Cumbria on his way to Scotland. Before mechanised transport, if you could not afford a carriage journey, you walked. Thomas Carlyle walked from Ecclefechan to Edinburgh to start his university course and John Snow, who identified the cause of cholera, walked from York to London via Bath to start a new job. Others have more recently walked from John O’Groats to Lands End or around the whole coastline for charity. This is more a personal pilgrimage. It will probably not happen until late spring/early summer 2018 as we are away for much of the first half of 2017. I prefer to walk in Scotland at that time of year if possible as it is usually drier, the days longer and the midges fewer in number. have you read simon armitage walking home? Wow – this sounds like quite a pilgrimage. I’m impressed with this goal. I know you can do anything you set your mind to, including walking from Boston to San Francisco, or even New York to San Fran for that matter! 😉 Please keep us posted.